SEASIDE, Ore. - A rare fish from the deep that had the Seaside Aquarium buzzing today has died. The ratfish, described as both cute and bizarre, and usually lives too deep in the ocean to show up on land. But a group of kids from Oregon City brought in a three-foot-long Spotted Ratfish over the weekend. They had found it on the southern cove area of Seaside -- still alive. Aquarium spokeswoman Tiffany Boothe says the spotted ratfish's technical name is 'Hydrolagus colliei,' and is named ratfish for its rat-like appearance. Scientists were not sure if the fish would survive the night. It had a sore on it's right fin that was making life difficult. Boothe said "at one point, it got stuck upside down and couldn't right itself." On Monday Boothe said the fish didn't make it through the night. She said "the fact that he was already washed up on shore was not a good sign to begin with." The aquarium was keeping the fish in a freezer in case a local school wanted to disect it to try and figure out how it died. 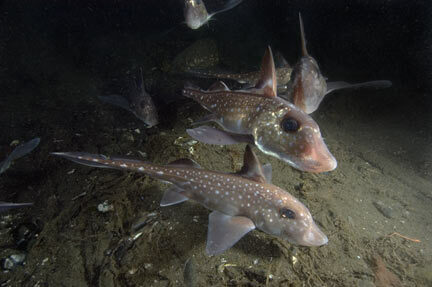 The ratfish exists between southeast Alaska and Baha, California. But sometimes it is found in shallower waters off the Oregon coast. The aquarium says sometimes fishermen bring the ratfish when they accidentally catch them. But Boothe says it's really very rare they wash up on the beach.